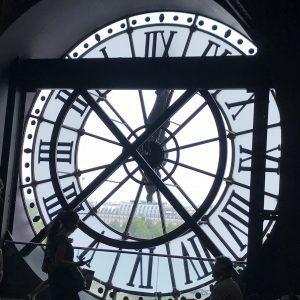 Les aventures du quatrième jour – A day that differs from the rest due to the rich collection of artwork at the Musée D’Orsay. Long blog post, but I felt it was necessary. Our journey through the city of Paris continued today as we visited the 7th arrondissement to see the breathtaking Musée D’Orsay. This was just my second trip to an art museum in the past 5 years, the first being only three days ago. This morning after breakfast was served, we all made our ways over to the ISA to meet. We left the ISA promptly at 9h30 to take the RER one stop over to the old train station which has now been transformed into the Musée D’Orsay. The RER is a great system that the city of Paris has, as it stops less frequently than the metro and travels farther between the stops. I appreciate both the metro and the RER because of how easy and convenient they are. We arrived to the Musée D’Orsay and immediately dove right into a pool of knowledge that was previously unknown to me. We began by learning about the Academy and their standards for “acceptable artwork”. We discussed and were able to observe linear perspective, truncation, and the portraying of proper human anatomy in all the Academy accepted artworks. 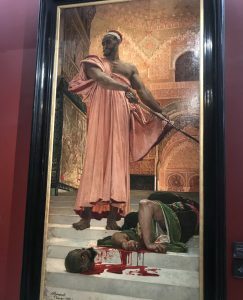 One of the most amazing works that we saw in the beginning of our tour was the Summary Execution by Regnault. It was clear that the Summary Execution represented norms of painting established by the Academy. We discussed how this Italian Baroque painting displayed the man who was beheaded almost popping out of the photo because of the truncation used when painting the body parts. The linear perspective and accurate depiction of human anatomy was also discussed when viewing this artwork. The next work of art that I found to be very intriguing was Les Glaneuses by Milet. 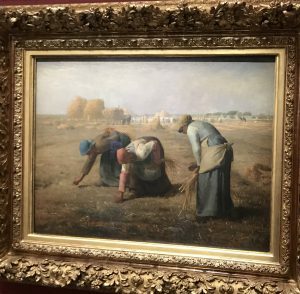 We discussed how this painting displayed three women in the fields gleaning. An important point that was made in our lesson was that the three women had to have been below the poverty level and likely did not have enough food to make it through the winter with their families. The harvest appeared to have been complete, but these three women remained gleaning in the field. This painting sends an important political message about the worker’s revolution, as it was completed in 1848. We also learned that the difference between realism and naturalism in art is that a realism work will always convey a political message. 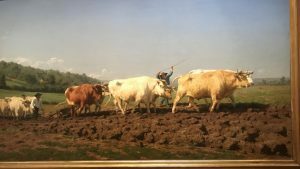 One last work of art from the first floor that I found to have an amazing story was the Gold Prize Academy winner painted by Rosa Bonheur. This painting is called the Labourage Nivernais. In 1849, women did not have the type of access and training when it came to learning how to correctly display human anatomy. Bonheur resorted to learning how to depict animal anatomy instead. The story becomes very interesting when it is realized that women also did not have access to slaughter houses. Bonheur cross-dressed to appear as a man and enter slaughterhouses to learn more about animal anatomy. Get this: cross-dressing was also illegal! Bonheur had to apply annually with the police to cross-dress. 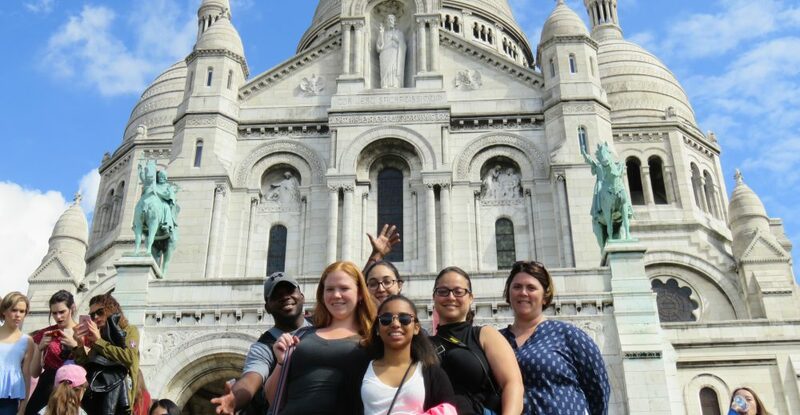 There were about 30 applications found in her desk drawer of her home! The more paintings we saw, the more I learned and became even more intrigued throughout the day. 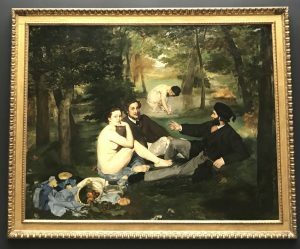 We saw incredible works of Monet, Manet, Renoir, Degas, and Caillebotte. We learned about the Salon de refusée created by Napoleon. More people visited this than the actual salon because they wanted to understand why the art was rejected by the Academy. We also saw the work of Courbet and the work of the orientalist era. After the museum, we all went to lunch and then to our afternoon film class. Our afternoon class was packed with interesting information about the origin of French film as well as the progression over the years. We related movies that we watched before coming to class to some of the very first “booms” in the world of French film. Hearing the thoughts of others through our class discussion was very important to me as well. This was an extremely valuable day for me, as I typically would go to an art museum and look at the different works without knowing the true stories behind them. As a visual learner, I was able to absorb so much information today by looking closely at each work of art while listening to what was being taught to us. 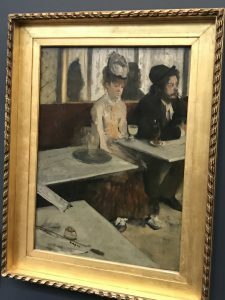 I wish that I could explain more of what I learned about these works, but there were just so many unbelievable works of art in the Musée D’Orsay. This entry was posted in Uncategorized by jennifer_lee2@student.uml.edu. Bookmark the permalink.